Freezer Capacity: 6.1 cu. ft. This Kenmore 20.5 cu. ft. top-freezer refrigerator has a spacious capacity of interior space, plenty of room to stock up on fresh groceries, leftovers and household snacks without overcrowding the fridge. Adjustable full-width shelving, 2 humidity-controlled crisper drawers and an integrated snack pan give you plenty of options for keeping your food neat and accessible. Keep lunch meats, cheeses and dips at your fingertips in the snack pan while the adjustable shelves can handle your household basics alongside tasty leftovers. 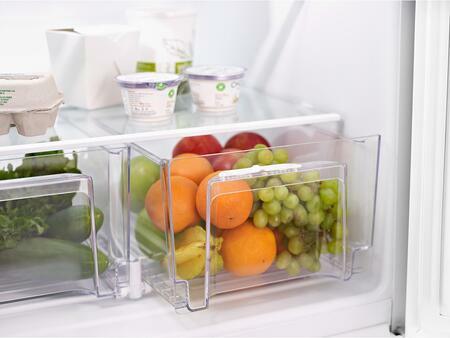 Spacious, tight-sealing and designed to control humidity, Kenmore crisper drawers deliver fresher, crunchier fruit and vegetables, so you can stock up on produce. The integrated snack pan keeps treats like yogurt, string cheese and more organized and easily accessible. Adjustable gallon door bins, a full-width bottom shelf and a dedicated dairy shelf help to keep your condiments, beverages and butters neat and organized. 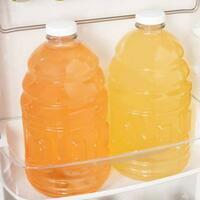 Stock up on milk, juice and wine without overcrowding the interior shelves or having to cram things in to the door bins. 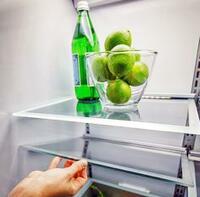 Even tall items can fit on the bottom shelf, thanks to the adjustable bins. 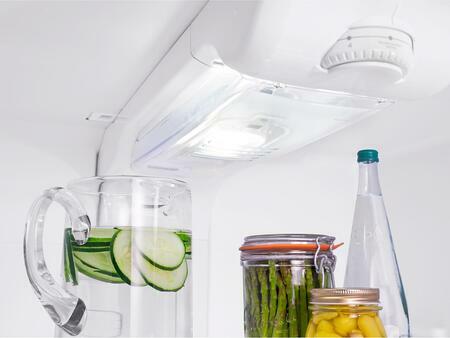 Maintain optimal freshness in both the fridge and freezer with the easy-to-adjust cooling system. 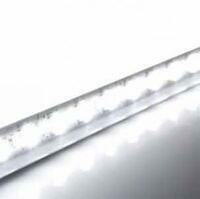 Depth with Door at 90 Degrees: 62.5"
After doing so much research I decided to go with this model. It arrived in timely manner and in perfect shape. What else do I want. I'm satisfied with my purchase. 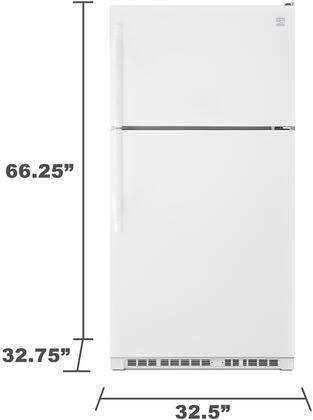 My husband was fed up with our last fridge so we did some research and decided that Top Freezer fridges would match our kitchen the best. AppliancesConnection.com had great bundles and we saved a lot when we bought our Kenmore fridge! 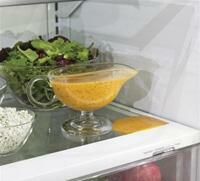 There really is no competing with the convenience of the Kenmore refrigerator. 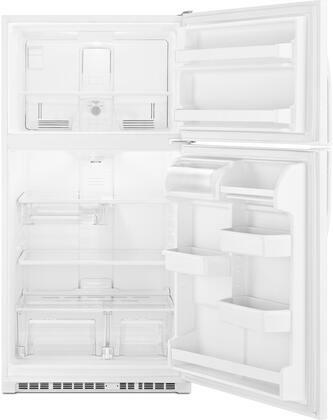 It's got a ridiculous amount of interior storage and the Top Freezer design looks amazing. I've been a loyal Kenmore customer and this refrigerator has yet again that my loyalty's been well placed. I love all the features. My oldest Kenmore appliance has been going strong for 15 years and, with the fridge's build quality, I expect no less from it. I cook for a living and take my work home with me sometimes. That means I need a spacious, reliable fridge at home too. This Top Freezer Freestanding refrigerator is very similar to my professional model at work and can store anything I need. Amazing purchase for my family, Right size, right model and especially right place to purchase it from !. Keep up the great work Appliances connection. 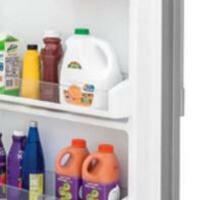 Even when I load my new Kenmore Top Freezer refrigerator up to the gills, it is overwhelmingly consistent at keeping everything cold. Consider me impressed. 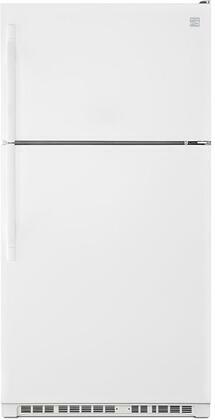 I've had this Top Freezer refrigerator from Kenmore for almost a year now and I love it. It's got so much storage space and the Freestanding design makes it fit perfectly in my kitchen! In our family, we traditionally host the holidays at our house and our old fridge barely made it through last year. 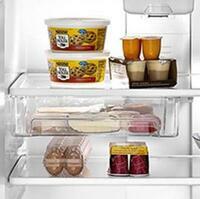 This year we bought a Kenmore Freestanding refrigerator that can be configured to hold an entire Thanksgiving dinner! So excited!